New footage filmed from the police helicopter shows the extent of the damage caused by flooding in St Michaels. The 23-minute video shows the work being done to repair the river embankment where rising water levels tore through the mounds of earth. Filmed on Wednesday, as workers rushed to patch up the damage ahead of fresh downpours that night, it shows water trickling back into the rivers. The camera zooms in on three men atop the embankment just next to a gaping hole where the defence was breached on Sunday. Although the military was drafted in to speed up the process of patching up the flood defences with sandbags and mud, it was not enough to prevent fresh flooding on Thursday. 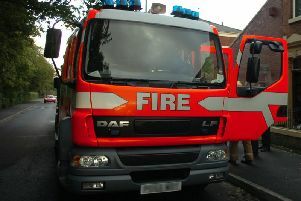 More than 20 homes were evacuated at the weekend and police said another 'seven or eight' were added to the list on Thursday. Water levels are once again falling but a flood warning remains in place as more rain is forecast tomorrow.